To promise or not to promise, should that be the question? Everybody loves to feel important. In fact, we all want to feel appreciated especially by our loved ones. This is the reason some people will make promises after promises in order to keep up appearances. People get too excited sometimes and promise both heaven and earth to their families and friends. It’s all good to make your family feel important but you have to make good on the promise. I remember one day my wife and I got too excited and asked our kids to each list up to 5 items they would like for Christmas! Now you don’t want to give such an opportunity to a 21st century child! When we later sat down to look at the scraps of paper we were shocked to see what their wish lists included. We knew that we had put ourselves in a very compromising position. Now we’ve got to come good on our promises! It is a noble thing to honor your promises. Many businesses have fallen as a result of people who do not live to their promises. Many families have crumbled because of broken promises. Relationships have soured as a result of unfulfilled promises. The interesting thing about most promises is that they are made when there is no pressure to make them. When we get over excited we tend to think that we can bring the sun down for our loved ones. And then start blinking when the day arrives and you can’t offer the sun as promised! The most interesting ones are the promises that involve money. ‘So when do you think you will pay back the money that you owe me?” Here you are given a rope to hang yourself. Because we usually want to impress, or because we don’t seem to think clearly, we usually say “I’ll pay you by the end of the month” or some such silly promise. Some parents and guardians have gone to the headmaster’s office to draw up a school fees payment plan to clear off the balance before the second month end. But because the state of our financial position is not healthy we fail to meet our month end promise. This makes most of us lose credibility. When December comes and my wife and I have not done anything about those wish lists, we’ll lose our credibility! A lot of us have made promises with the sincerest belief that we will honor them. When you promise your girlfriend that you will certainly make plans to marry her before Christmas it’s not that you’re dreaming, (even though some people just say it to shut the girl up) it’s because you’re feeling it in your gut. But you become a bad liar come December when there’s no ring on it! And some politicians have fallen into the “promise” trap many times in a bid to win votes only to get ‘too busy” once in office. Good intentions, no delivery. 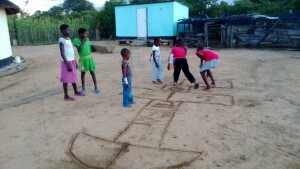 On the wet African soil, kids love to draw and play games. They never forget the promises we make to them.